Last week you could vote for which book I would read this month. 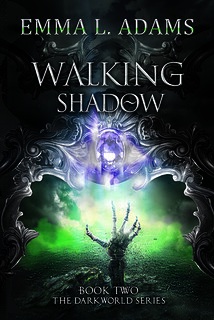 The book with the most votes was Shadow Walking! I have already read the first book in this series which I really enjoyed it. I also have a novella in this series for review, so I’ll read the novella first and then start this one. I am really excited to start reading this book! The vote was really close this month, Walking Shadow got 6 votes and Missy the Werecat and the Roche Hotel both got 5 votes! I didn’t know about this series, but it looks scrumptious. Enjoy your TBR pile read, Lola! Thanks for stopping by Sophia. I really like the covers for this series as well and am looking forward to read the novella and this book! Mine was close too! I’m glad you are so excited about the chosen book, hope you love it! It’s always fun to see the votes were close, not sure why, but I always like knowing that people are excited for all 3 books. After I finish my current read I am going to start this book. Thanks Stormi! I hope so too! Close one! I hope you enjoy your book! Karsyn @ KaKiJoKoJa recently posted…To Be Read List ~ Jan Poll ~ RESULTS! Yeah it was a close one indeed! Looking forward to reading it! I hope you enjoy it! I do love the cover and I’m curious to see what you think, since I wasn’t a huge fan of the first one, but was curious to know what happens. I enjoyed the first book, think I gave it 4 stars, had some issues with it, but overall I enjoyed it. I have high hopes the seris becomes even better as it continues. THAT COVER IS TEN MILLION TONS OF BEAUTIFUL. Loooove. This author her books have such pretty covers! I just finished the novella, so this book is next! I am goign to start this one next! Can’t wait to get back to this series!